REYNOLDS, Feb 23 -- A very unusual sort of accident occurred this morning, when Fred McDaniel was accidentally shot at his home one mile west of Reynolds. McDaniel had just returned from the field where he had gone to shoot birds, when his wife drove in from town in their automobile, and they had paused in the yard, talking. While thus engaged McDaniel allowed the shot-gun to lean against his person, and their three-year-old child, who was playing about them, got a hand on the trigger, causing the gun to fire. The load entered McDaniel's body just under and a little to the fron of the right shoulder, penetrating the right lung. Physicians hold out slight hope for his recovery. 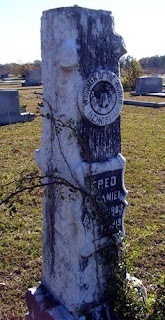 McDaniel belongs to a prominent family of this section, and is widely connected. He has been engaged in the garage business for several years, being employed at the time of the accident in the garage of Ed Musselwhite. 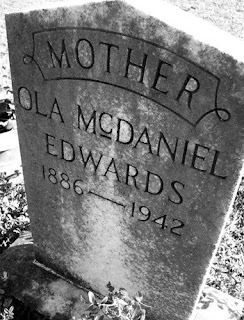 Buried next to Fred McDaniel in Hillcrest Cemetery is Ola McDaniel Edwards (1886-1942). Ola was Fred's wife at the time of the accident. After his death, Ola moved to Russel County, Alabama. She later married Sylvester Edwards and lived the rest of her days in Bibb County, Georgia. Upon her death, she was brought back to Reynolds to be laid to rest next to her first husband. An interesting note: census records suggest Fred was a half-brother to Eva McDaniel who was written about a few days ago on this blog.